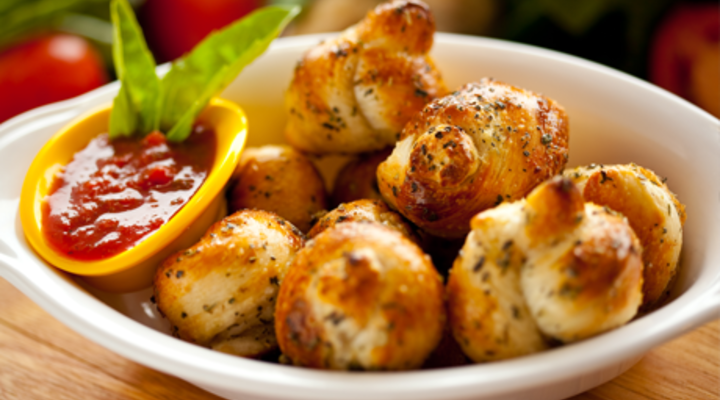 This is perfect for sharing, just pull apart the warm doughballs of flavour. Dip in some olive oil, or garlic butter. Grease a 11 x 21cm loaf tin. Pour the warmed water into a bowl and add the yeast and sugar, stir to combine. Sift the flour into a bowl and make a well in the centre. Pour in the yeast mixture and stir using your hands to bring the dough together. Turn the dough out onto a lightly floured surface and knead for 10 minutes until smooth. Return the dough to a lightly oiled bowl and cover with some clingfilm. Set aside to prove until doubled in size, this will take between 40 – 50 minutes. Place the herbs and cheddar into a bowl and combine. Using your fist punch down into the centre of the dough then turn it onto a floured surface, knead for a further 2 – 3 minutes until smooth and elastic. Divide the dough into 18 pieces, then roll into small dough balls approx 5cm diameter. Combine the garlic with 1 tbsp rapeseed oil. Place 6 dough balls into the base of the loaf tin and brush with the oil and garlic mixture and spoon over a layer of the cheese and herb mixture. Repeat this process with the next two layers, then cover with a clean tea towel to allow the dough to prove for 30 minutes. Place into a preheated oven and bake for 40 – 45 minutes until golden.